BBC NEWS | Asia-Pacific | Should tourists go to Burma? In the last of a series of articles from inside Burma, the BBC's Kate McGeown asks whether tourism helps or hinders the local people. It has golden pagodas, beautiful beaches and welcoming people who badly need a better income. It also has a repressive military regime accused of serious human rights abuses, and a detained opposition leader who has repeatedly urged people not to visit. So should tourists go to Burma, or is it better to stay away? 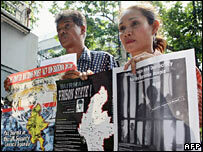 According to Burma Campaign UK, which lobbies for human rights and democracy in the country, the decision is obvious. "Once people know what the issues are, they invariably choose not to go," said Mark Farmaner, a spokesman for the group. Have your say: Should tourists visit Burma? "It's impossible to go there and not give money to the government. From the moment your plane hits the tarmac, you're lining the military's pockets." In fact, according to Mr Farmaner, Burma is unique in that many of its human rights abuses are directly connected to the military's decision to promote tourism. "Much of the country's tourist infrastructure is developed by the use of forced labour," he said. "People have been made to construct roads, airports and hotels, and thousands more have been forcibly relocated to make way for tourist areas." It is because of the close link between the tourist industry and the government that Burmese opposition leader Aung San Suu Kyi, who is currently under house arrest, has on several occasions asked tourists to stay away from Burma. "Tourism to Burma is helping to prolong the life of one of the most brutal and destructive regimes in the world," she told reporters once. "Visiting now is tantamount to condoning the regime." But the problem is that, on the ground, many local people are extremely glad to see foreign visitors. "It's very difficult," one tour guide said. "I really respect Aung San Suu Kyi, and I understand why she wants a boycott, but then we desperately need tourists' money here - not just for me but for other people too." Even people not employed by the tourist industry seemed genuinely happy to see me during my trip. Arriving there, I was greeted by an elderly man who thanked me for coming - a remark which was repeated throughout my trip. Many people were anxious to ask about life outside the country - not just about politics but literature, art and, of course, football. Others said they wanted foreigners to understand what was happening in Burma - which a steady stream of politically conscious tourists will undoubtedly help to do. One BBC News website user, Emma Smale, had a similar reception when she visited Burma with her boyfriend last year. "The people were so nice and friendly, and we were always well-received. I think they definitely wanted us there," she said. "Once they were confident enough to speak to us, they were also really interested in asking about life outside their own country." Ms Smale made sure she was well-informed about the issue before making her decision to travel to Burma. "I definitely respect what Aung San Suu Kyi said, but I felt I had to see the place for myself," she said. Ms Smale does not regret her decision to go. "It's the best place I've ever been to," she said. "It's had a huge influence on me." There are compelling arguments either way, and the subject even divides the publishers of some of the world's best-known guide books. Lonely Planet has made the decision to publish a guide to Burma because it believes its role is to provide balanced information so travellers can reach their own conclusions. "We can ensure people know the facts so they can make an informed decision," said spokesman Stephen Palmer. "We can also advise people so they can minimise the money they give to the government, and maximise the amount that goes to ordinary people." But critics say that by publishing in the first place, Lonely Planet is encouraging tourists to visit the country. The Rough Guides travel company has taken a different stance, choosing not to publish a book on Burma until the political situation improves. "We don't believe the benefits of travel outweigh the disadvantages, so we actively encourage people not to go," said spokesman Richard Trillo. The debate goes on. But whatever governments, campaigners and tour agents have to say on the matter, the decision is ultimately up to you. 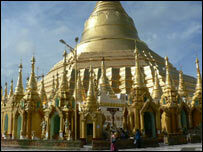 Do you think tourists should visit Burma? Have you been to Burma as a tourist? Send us your comments and experiences.